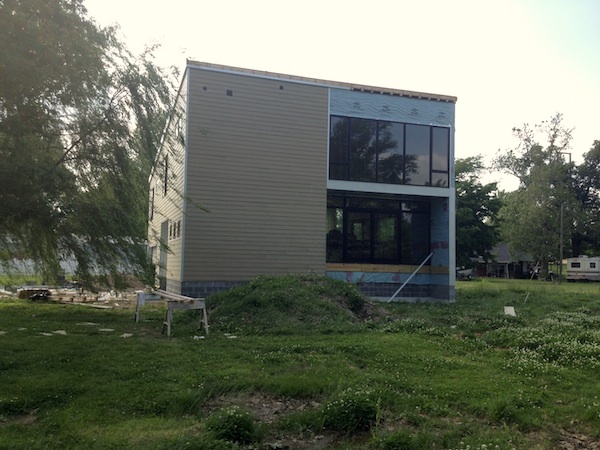 PA Plat House - great progress! 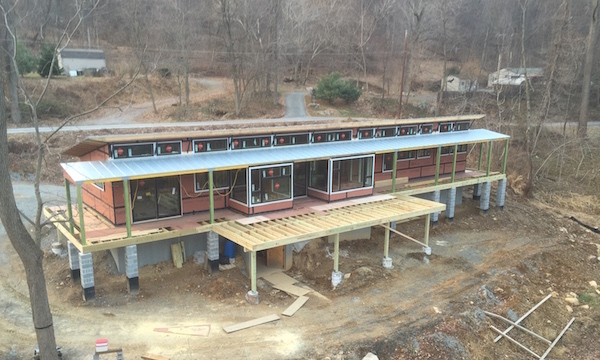 We've not looked at the Pennsylvania Plat House that is under construction since this past summer, and its made great progress since then. The house is closed in, windows install, metal roof on top. It really looks like a Plat House now! 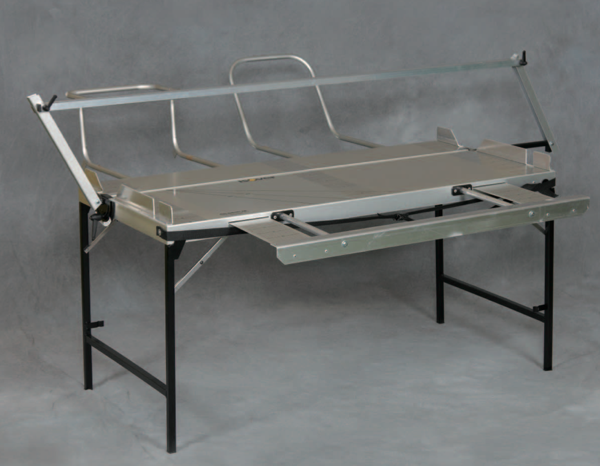 In order to put the metal roof on a Plat House you have to install the steel overhang braces, and the overhang beam. This stuff is the heart and soul of the Plat House Design. So even though the PA Plat House still has a bit of work ahead, it is really taken on the family resemblance that all us Plat House fans love. Check it out. The owner shot these pictures from the boom lift truck he had on site during the work to install the roof overhang braces and install the metal roof. You can get a read on the site topography here from this height. A nicely sloped site, will allow you to enter the house near grade on the road side, and put the decks at the tree canopy level, in this case with a walk out basement below. The decks overlook the Susquehanna River in central Pennsylvania. Beautiful. 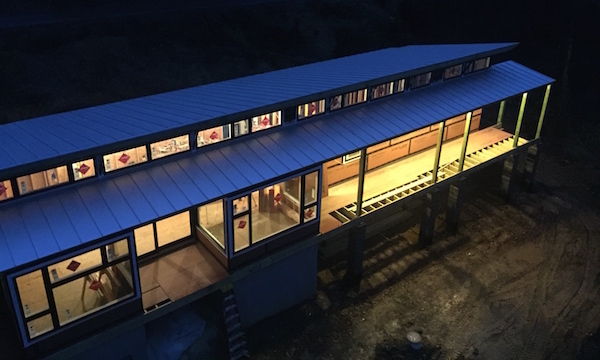 This is a lovely shot of the Plat House glowing in the early evening. Well, you regular readers know the drill. More photos can be found in the Flickr album. And the catalog page is here for your convenience. So wear your heart on your sleeve, print out your favorite picture of a Plat House and pin it up over your desk just like I am! 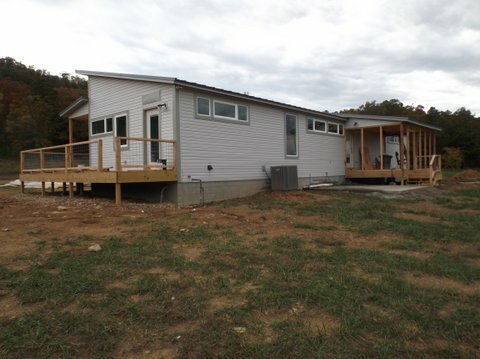 Continue reading "PA Plat House - great progress!" Each picture of the XHouse1 we receive looks that much closer to being finished. Each one shows another detail being finished off. Trim, done, cabinetry, installed, furniture, delivered! Last view with fall leaves still on the trees. Keep an eye on the Flickr set as the house comes down the final stretch! 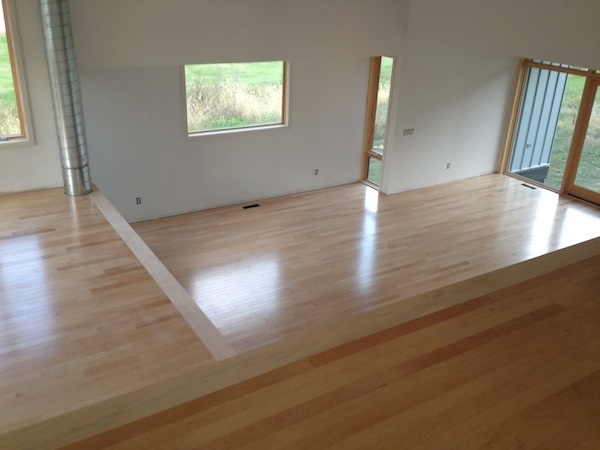 Continue reading "XHouse1 First Build - closer to the finish line"
The floor was finished up this past week as the maple trim pieces were varnished to match the factory finish on the floor planks. 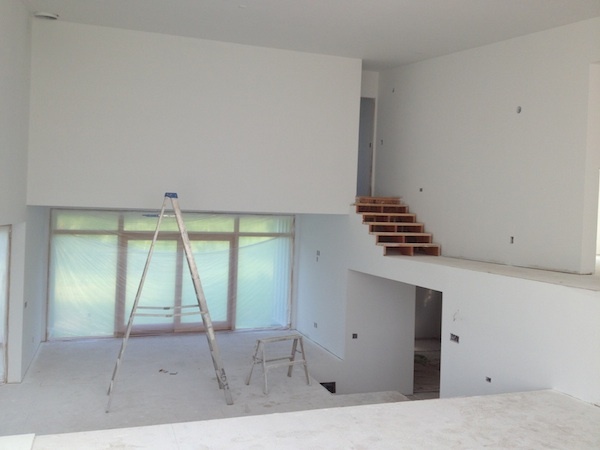 Here you can see the builder finishing up the trimming of the drywall at the stair risers and treads. And the flat-pack cabinet bodies are now well underway. We'll see the installation of the kitchen cabinets next. 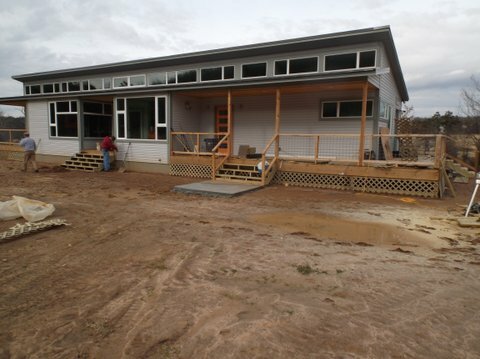 Thanks for following and make sure you look at the Flickr album for this house to see all of the progress photos. Thanks to our customers for sharing their builds! And you, our readers - we look forward to you joining our family of modern homeowners! 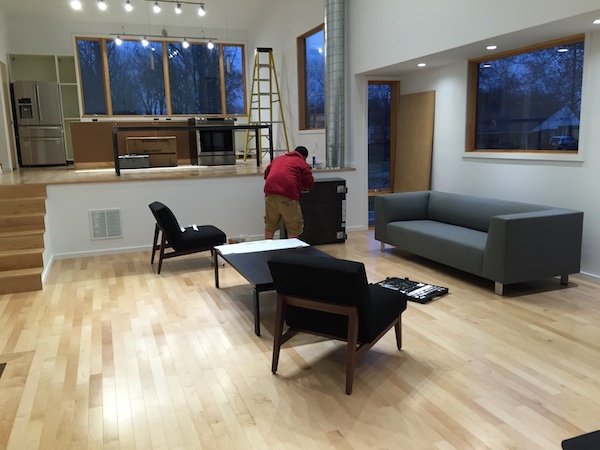 Continue reading "XHouse1 First Build - more interior progress"
The XHouse1 had maple hardwood flooring installed this week, tipping the scales. It now feels more like a home than a construction site. 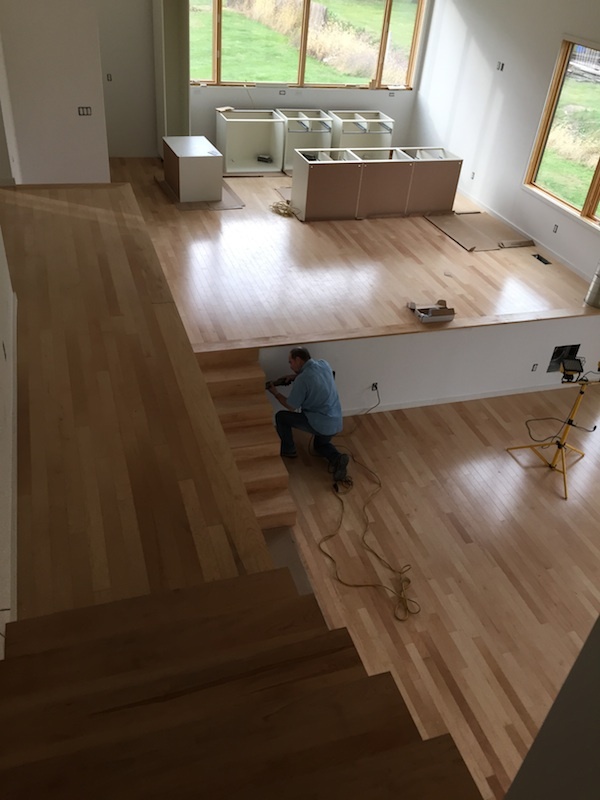 Its hard to pin down exactly when a project goes from "construction site" to "unfinished home", but the XHouse1 definitely crossed that line this past week when the maple flooring was installed. Maybe it is the finished floor that really makes that difference. Up until now if you dropped a hammer on the floor, no harm done. If you walked dirt into the house - sorry about that, but nothing damaged. Not so anymore. Now it feels like you are walking around in a house, not a work zone. I hope you are keeping up with the house in our Flickr album. You can see all the photos that are shared in the ablum, and comment too if you want. Continue reading "XHouse1 First Build - interior the flooring is done"
Formwork for casting the concrete steps and landing at the front door of the XHouse1 is going together now. Within a few days the concrete should be poured. Remember you can also follow the progress of the construction of this house in the dedicated Flickr album. Its never possible for us to publish every photo here on the blog. Our thanks go out to our customers for sharing their house builds! 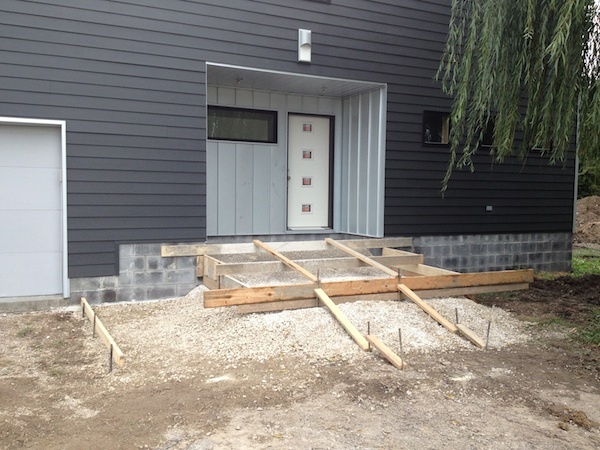 Continue reading "XHouse1 First Build - front steps forming up"
XHouse1 First Build - there is light! Light bulbs arrive - LED light bulbs. Yes, its seems its finally arrived, we can outfit our homes with LED light bulbs. They are still more expensive that the CFL equals, but worth it. The use even less power and last even longer. The house is really starting to come together now, and soon we will turn that corner from looking like a construction site to looking like a home. 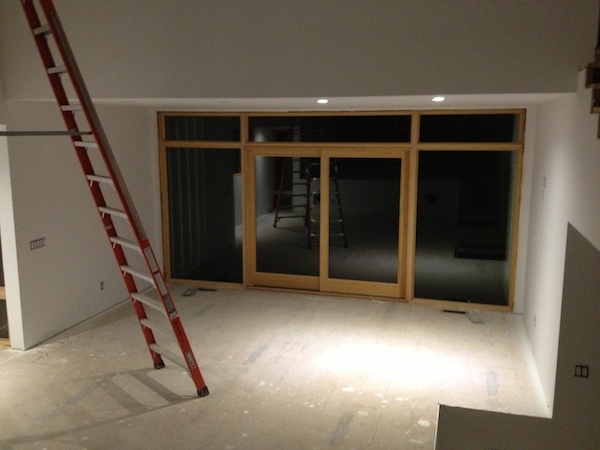 Continue reading "XHouse1 First Build - there is light!" One day its just a shell, the next its a living breathing thing, a home. 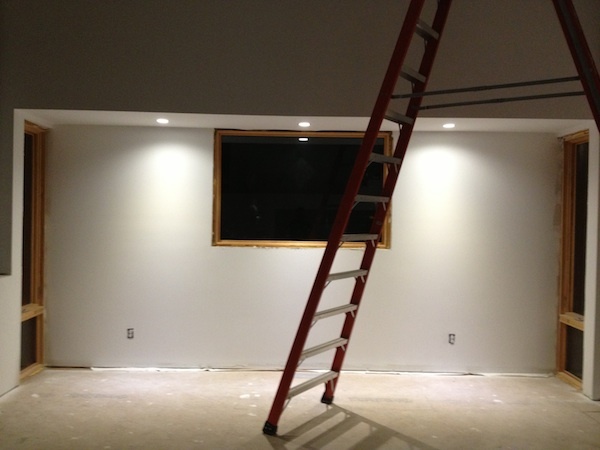 Continue reading "XHouse1 First Build - HVAC happens"
Interior painting has begun inside. This is the first step before other finish activities get under way. The open living/ dining/ kitchen space is getting a coat of white. Note how bright the space is even without any light fixtures on. 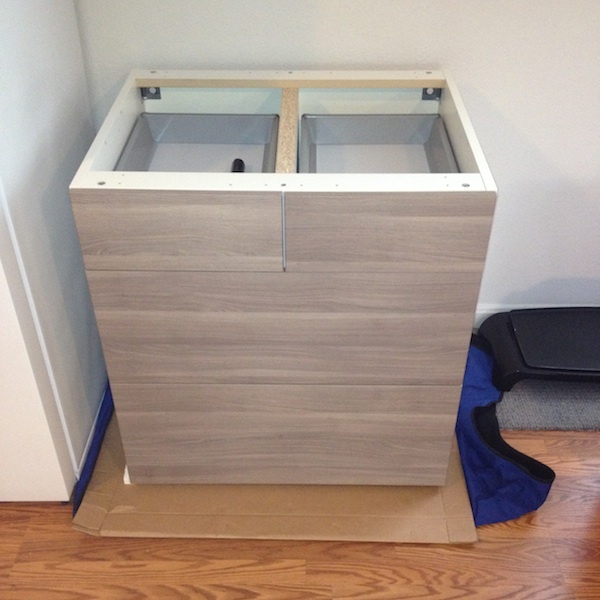 The kitchen cabinets are going to be from Ikea, value stalwart for the modern homeowner!. The Owner has built one up to see what they look like, and this is the result. Pretty sweet - Ikea delivers the modern cred. 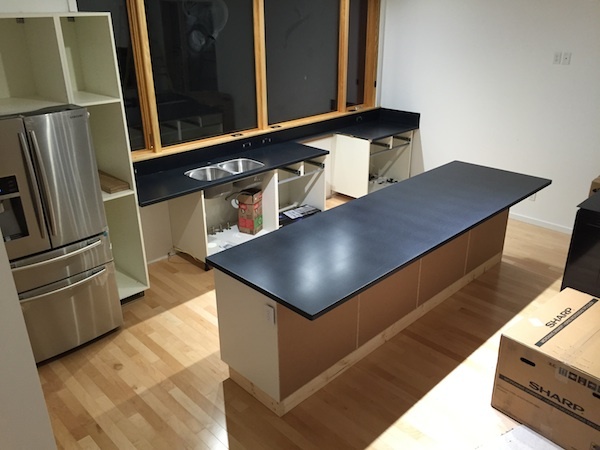 This is why we see many smart developers using Ikea boxes for the kitchen fitouts. 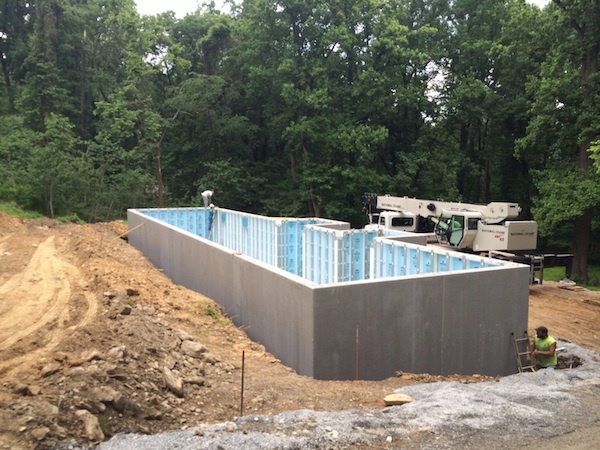 Continue reading "XHouse1 First Build - interior painting has begun"
The new Plat House project in Pennsylvania has begun rough framing. 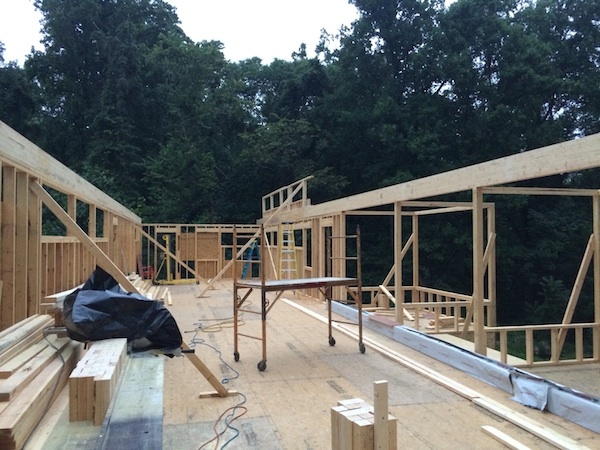 Progress comes fast with the simple framing of this house, and the framing should be complete very soon. Here the exterior wall framing is pretty far along. They've just started on the clerestory window, high on the bay window side of the house. And the sloping side walls are not yet framed up to the full height of the house. 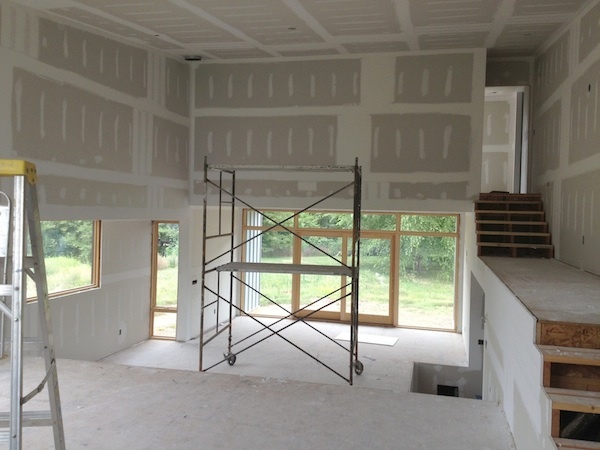 And here you see the clerestory window wall framing is complete, and the sloping side walls are also finished. The walls are all in place ready for the framing of the roof to begin. More photos are posted on the Flickr album for this new project. As always our thanks go out to our customers for sharing their builds with us. Continue reading "PA Plat House - now well underway"
The site has been tidied a bit in anticipation of the work moving indoors for the remainder of the project. Note hay has been thrown around the perimeter, and the grade has been leveled and the remnants of foundation excavation have been smoothed out. Maybe not final grading, but cleaned up grading. Continue reading "XHouse1 First Build - more picture"
The interior sheet rock joints have been finished and the interior is ready for painting. While additional coats of paint go on outside, the interior will continue with floor finishes, cabinetry, the hanging of doors and installation of hardware and fixtures. This XHouse1 is the first example of this design to be built, and its available in our catalog here. 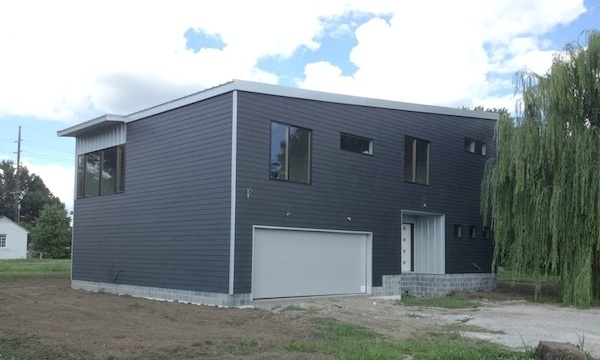 Its also the first house from our XHouse collection to be built, which is a family of designs with fresh contemporary theme, and our first designs to feature our energy efficient USA New Wall assemblies. Continue reading "XHouse1 First Build - inside moving too"
Continue reading "XHouse1 First Build - more paint"
While the finishing inside is going strong, the painters have shown up to paint the outside. The light tan color we've seen on the house is just the primer, and the owner is looking at a rich warm carbon grey tone for the outside. Here is the first coat on the kitchen end wall. The color is a little bit streaked for that first coat, it does not have 100% coverage over the primer yet, but you can see the color clearly enough. Things are happening quickly all over the house now, and it will quickly go from looking like a construction site to looking like a home. Stay tuned for the final transformation of this exciting home. Continue reading "XHouse1 First Build - painting outside"
The work has entered the next phase. 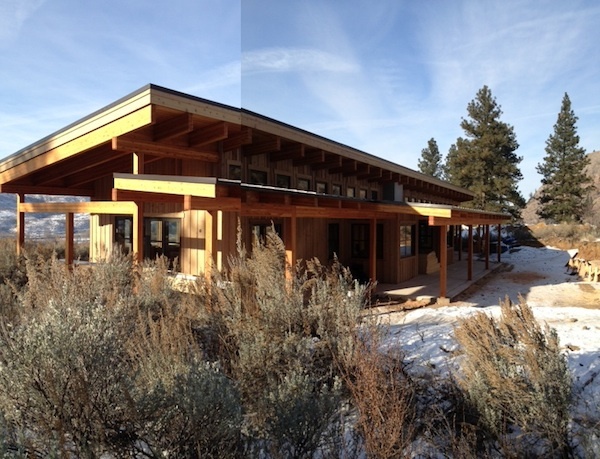 The exterior is mostly done and weather tight, the systems inside are installed, and the house fully insulated. Its time to finish the interior. Remember to check out the images on the catalog page for this house, so you can see how its turning out so close to the visualization presented there. There is even a drawing of the master bedroom! 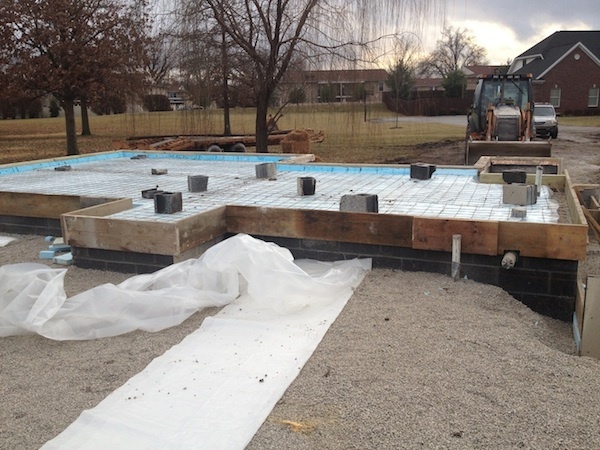 Continue reading "XHouse1 First Build - drywall happening right now"
I am very happy to see that we will have a new Plat House build to follow this summer. 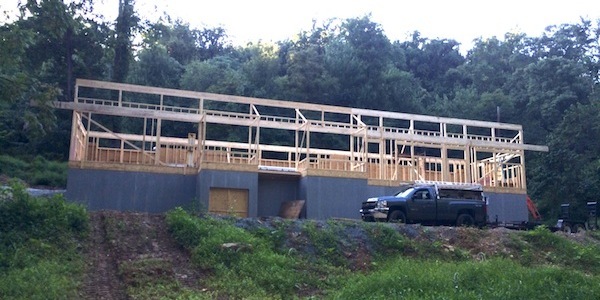 A customer in Pennsylvania is building the very first Plat House in the Quaker State, and I know I am looking forward to watching this one get built. I may even have the opportunity to visit this one - a rare pleasure. What you see here are a pre-cast concrete foundation wall product called Superior Walls. They prep the house footprint with a stone bed, and the pre-cast wall sections are brought in and placed without a conventional footing. Very fast, very tight, pre-insulated. Not inexpensive, but a great product. 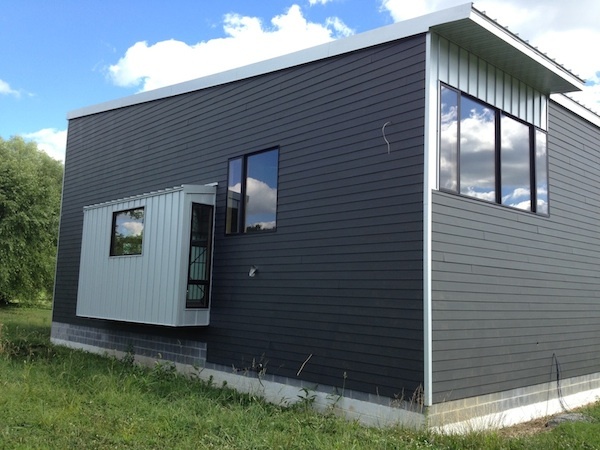 Continue reading "PA Plat House - new Plat House build coming this summer"
Pleased to share that the siding work is complete - the cladding is installed on all 4 sides. And the stone wool insulation inside is also complete. The tan color is the factory paint primer, but the house looks remarkably like the illustrations from the catalog page. The stone wool insulation is almost complete in this photo. 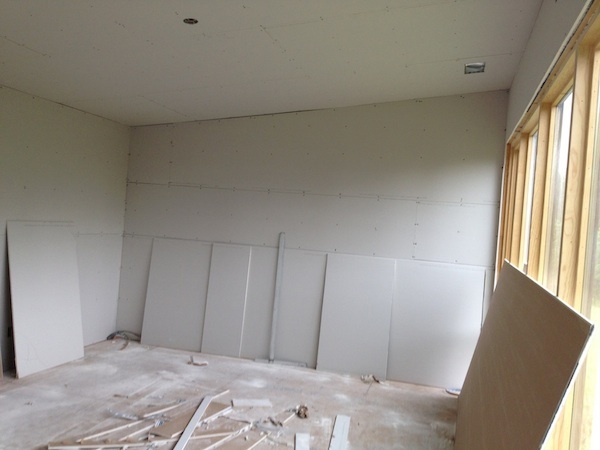 The 2x6 walls are insulated with R23 stone wool batts by Roxul. The ceiling/roof has two layers of R30 - this is possible because the dense stone wool is only 7.25" thick for R30, makes it easier to have enough room for two layers. The internal partitions are sound insulated with an additional stone wool batt. 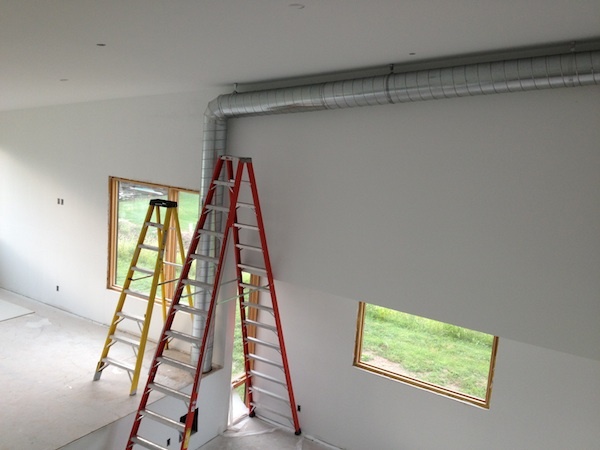 This will be wrapped around the interior with a smart vapor control membrane that blocks moisture vapor when dry, breathes if wet, and contributes to the airtightness of the house. 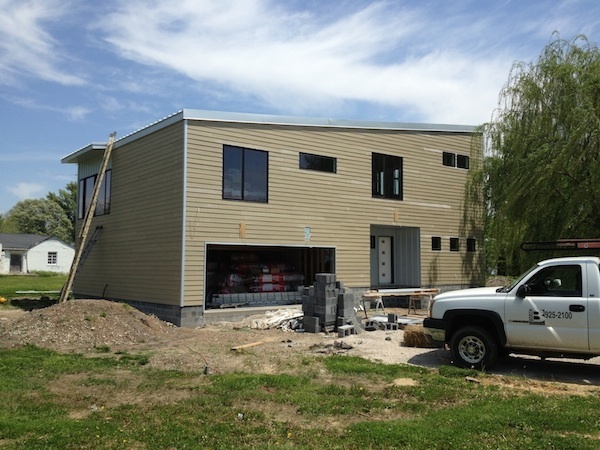 Continue reading "XHouse1 First Build - siding complete, insulation as well"
Great to see progress views of the other two sides of the house. Here the siding on the back side of the house is almost done. The standing seam galvalume cladding on the bay window is done, and the rest of the lap siding panels should follow soon. This is the end of the house where the living room, and master bedroom above face out to the yard. 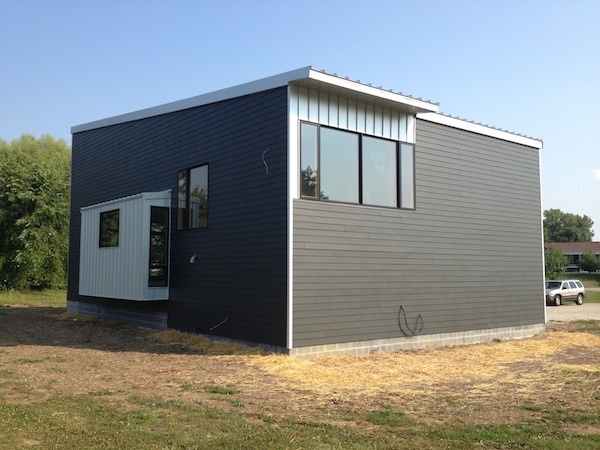 The lap siding panels are done here, and the standing seam metal at the master bedroom window wall remains to be finished. You can look at the metal siding above the kitchen window on the opposite end of the house to get a feel for how this side will finish. Or have a look at the illustrations on the catalog page. 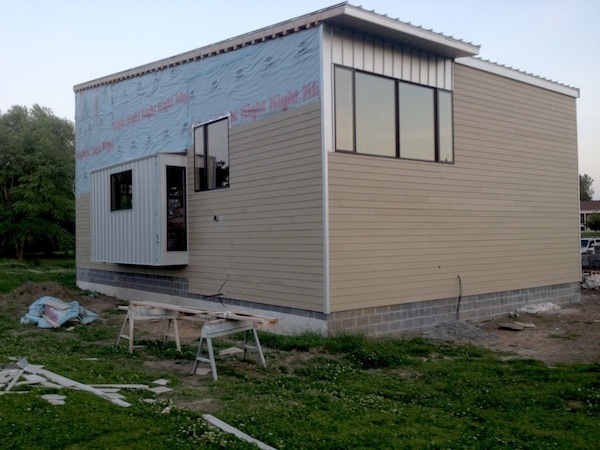 Continue reading "XHouse1 First Build - more siding, more views"
I love that its looking more and more like the catalog illustrations! 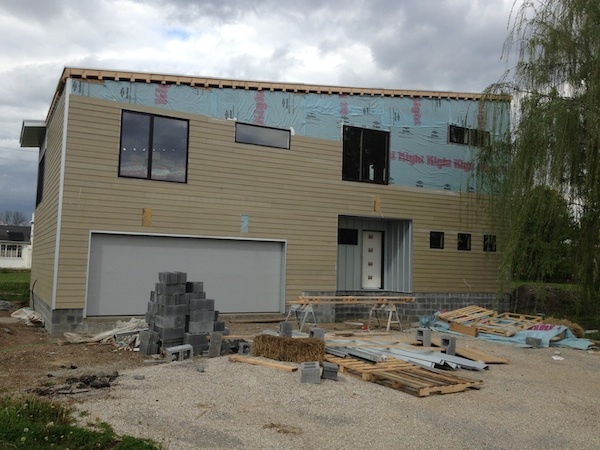 Continue reading "XHouse 1 First Build - front siding done"
Its very exciting to see the cladding going on the house now. It really begins to take on a familiar character as this texture appears on the surfaces of the house. If you've not looked back at the catalog page recently to see the drawings of the house, now would be a great time to compare. 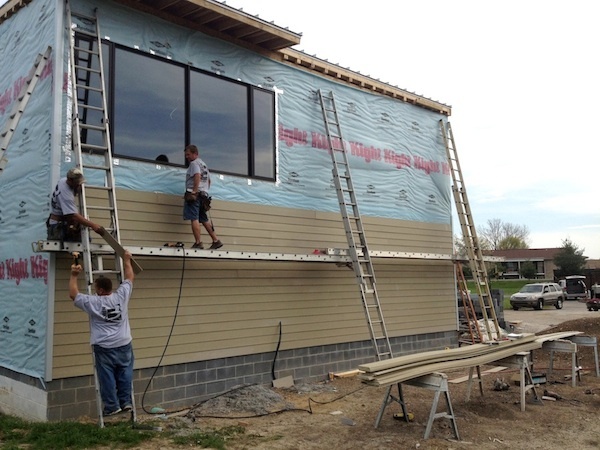 Here siding is being installed on the end wall, at the kitchen windows. And here, somewhat later, the work has moved around to the front of the house. More photos of course are available in the Flickr album. 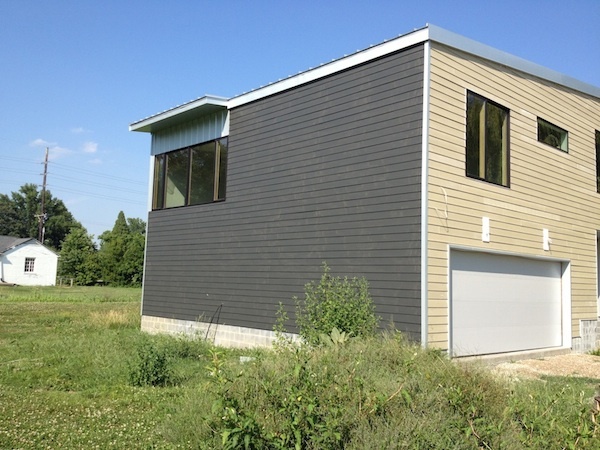 Continue reading "XHouse1 First Build - siding now"
Just a quick picture. 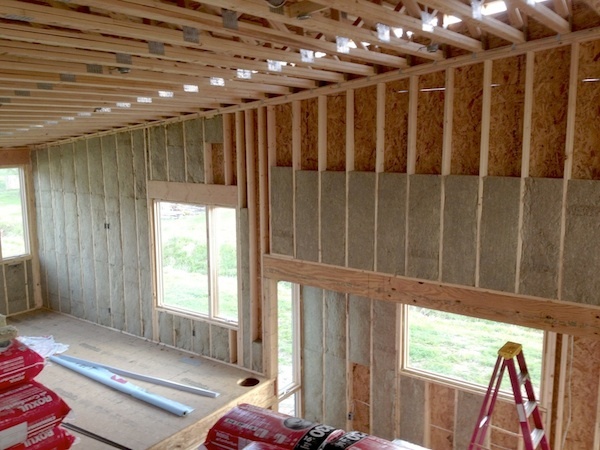 The owner is insulating the house himself, and he is using mineral wool for better energy performance. It also makes the house more sound-proof, and increases fire-saftety as well. With this insulation and the "smart" vapor control layer this first XHouse1 will have the "Good" version of the USA New Wall. See the XHouse1 in our catalog. 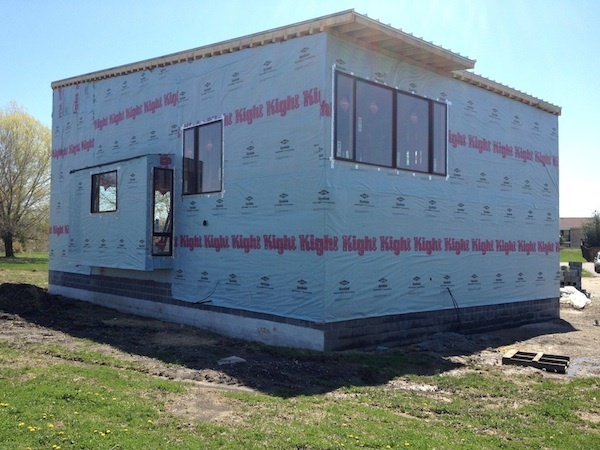 Continue reading "XHouse1 First Build - insulating"
The windows have been installed, and this clears the way for the cladding and the remaining exterior work to move ahead. The windows in this case are Marvin's Integrity line. These windows are of fiberglass construction, with wood interiors giving the appearance of traditional wood framed windows. A nice feature of these units is the wood interior can be omitted in rooms where it does not make sense - wet bathrooms - or not worth the expense - say a laundry room. They are sturdy, have good thermal properties, and since fiberglass framed windows are typically painted it means there are usually more color options than vinyl or vinyl clad windows. 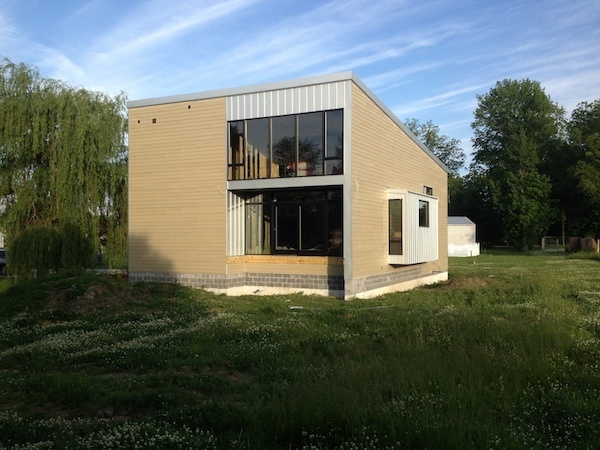 Continue reading "XHouse1 First Build - its all in the windows"
We've been following the story of how the homeowner got all the many tasks and variables in line to get the project off the ground. We will continue with that story, but in the meantime catch up in pictures. 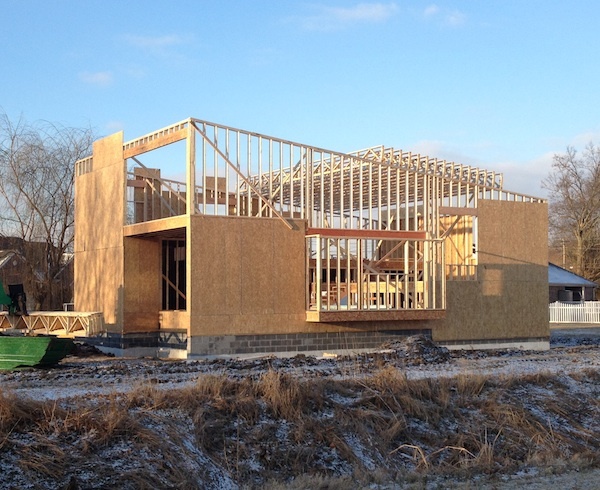 Rough framing of the house shell nearly complete. Continue reading "XHouse1 First Build - catching up on progress"
When we last left our customer MJ they had tried and failed to acquire a site for their new XHouse1. The site was in the right neighborhood, the right school district, the right price range. It had some characteristics that were not perfect, but not the deal killer. The deal killer was the the property owner's prejudice against a modern house, the scourge of anyone seeking a modern home. MJ and family returned to the property search and came up with another lot in a similar situation. At the end of a no-outlet street, mature trees on borders of the site, an established neighborhood with a diverse range of housing. 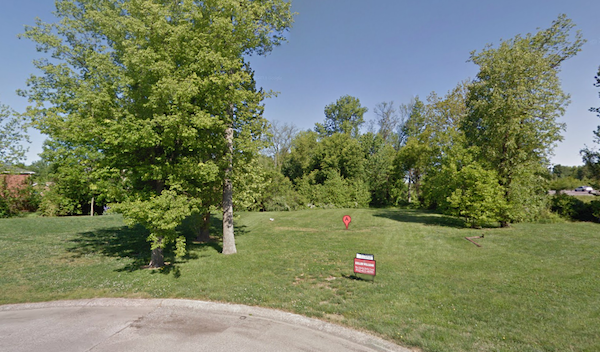 So what was an empty lot like you doing in a neighborhood like this? 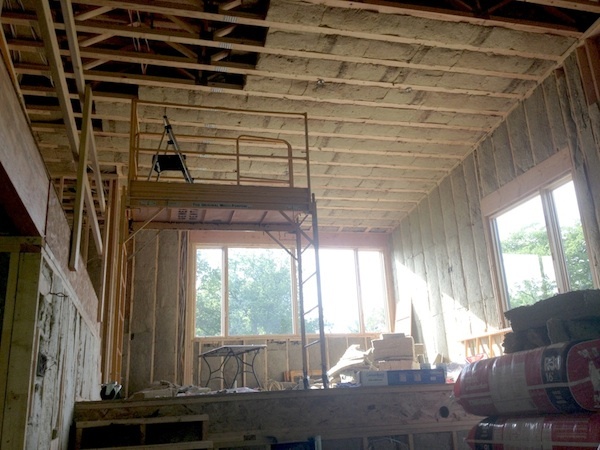 Continue reading "XHouse1 First Build - finding the site take 2"
Some time ago we published an article about mineral wool insulation. We wanted to explain why this was the type of insulation used in Sweden, and why it was the best option for making an affordable high performance house. In that article we showed a tool that is used in Sweden to cut insulation, and to make it easier to do a high quality installation: The SkärBoard manufactured by Ego-industri AB is the tool widely used in Swedish factories and construction sites. Many readers were curious about this, many wanted to buy one. Now finally its coming to the United States and Canada and you will be able to get one. The SkärBoard is simply the best tool for cutting insulation, and the only tool you need if you are indeed serious about good insulation installs. There is no faster, more accurate, or easier way to install mineral wool insulation and interior sound batts. And the SkärBord is effective for cutting a range of other insulation types as well, fiberglass, foam, and wood fiber insulation panels. Continue reading "The SkärBord (say Score-Board! )- the advanced insulation cutting tool"
With construction done, and the site cleaned up, the owner of the New Arkansas Plat House is happily living the dream in their new house, and awaiting landscaping in the spring. They've been treating us to some new photos of life in the house, which is always exciting and gratifying to see. We've been sharing them with you on the Flickr album of the house. Our thanks to the owner for sharing, and our wishes for a happy time in your new house go out to you, and to all our customers. Continue reading "New Arkansas Plat House - living the dream"
When we left our intrepid XHouse1 family, they had their existing house under agreement, triggering a sequence of must-do tasks, a critical path to being settled in their new XHouse before school started in the Fall of 2014. With a settlement date for the sale of their current home on the calendar MJ and family secured a rental home in the area where they would hunt for building sites. They knew the school systems they wanted, and it was a matter of locating a building lot in a neighborhood served by these schools. These were existing built-out neighborhoods. Not areas on the frontier of development in their region. So they would be scouting for empty sites in existing mature neighborhoods - always a sketchy proposition for a modern home. Continue reading "XHouse1 First Build - finding the site"
As regular readers know, the Plat House has been our most popular design, popular in sales, and popular in completed projects. We often wonder why that is so? I've always suspected that this was the inevitable result of people seeing real examples of the house built leading to more people building the house. And no doubt this contributes to the design's popularity. 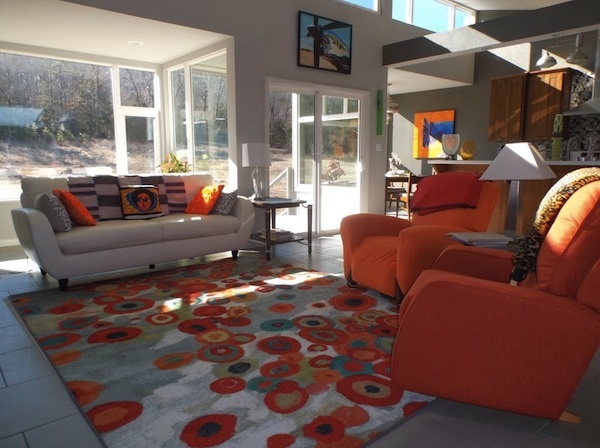 But when I see the diverse applications of this house in Maine, Hawaii, Oregon, I realize that the design has an inherent adaptability that broadens its appeal. Continue reading " Ten years later, Plat House continues to surprise"
At the conclusion of our last part of the story, our customer had contacted us and had their current home on the market. This was 4 years after our initial contact and their purchase of Design Prints of the XHouse1. The news that their home was on the market meant that the process had begun. Our customer MJ was concerned with the timing, and how long it would take for us to complete the Construction Prints so he could anticipate when he needed to order them from us. 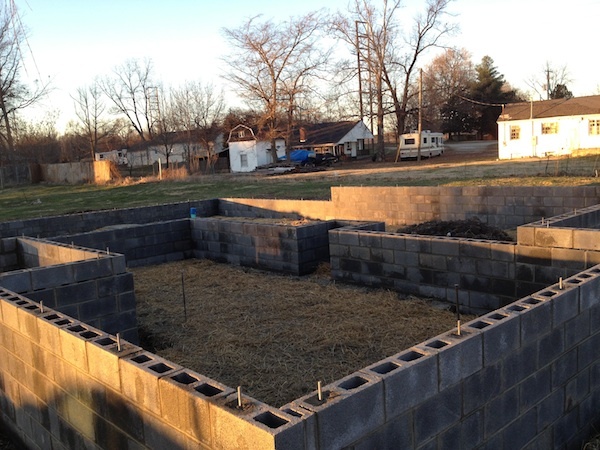 Continue reading "XHouse1 First Build - timing is everything"
The New Arkansas Plat House Owner has been in the house for a little while now, just in time for the polar air mass that descended on the nation in January 2014. The interior work is completed but for a small punch list. And the exterior is done, except for the last of the screened in porch, and the landscaping remains in post-construction form. But it has definitely moved from construction site, to owner occupancy, and we are very happy for the owner. But perhaps the most gratifying comment by the owner was this one: There is just something special about waking up at 3am to see the stars twinkling though the clelestory windows. Just Orion saying hello! 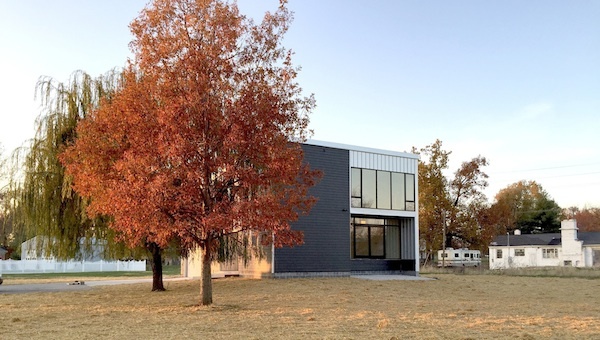 Continue reading "New Arkansas Plat House - occupied and buttoned down for polar vortex"
In our first installment of the XHouse1 First Build series we recounted the background of MJ, our customer and future XHouse1 Owner. Cold weather has delayed progress in the construction so today I'll just recount the timeline. In 2009 they had purchased Design Prints a few months after the design was posted to the catalog. Continue reading "XHouse1 First Build - timing is not everything"